Day by day Blogger is announcing the new feature that we have lately discussed about it. However, Google Blogger is improving its features and working continuously for more great services to make Blogger more professional and make large number of registered members. We are satisfied with all the new feature of Blogger. 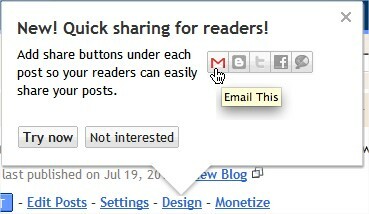 To make Blogger blog more socialize, Official Blogger has announced new 'Share Button' feature which was not available in Blogger's main page. This new feature have bookmarking buttons that we can share our content to all socializer. The 3 main social networking sites i.e. Facebook, Twitter and Google Buzz has taken part to share all blog content of blogger blog. There is also the link for Gmail and Blogger to share it. To embed this feature for your blog, Log on to your Blogger account > Go to Design > Click edit link of your blog post layout. Check the option 'Show Share Button'. Now, you can see this bookmarking feature to all of the existing posts of your blog. Blogger is calling for your help for more development works. Don't miss this chance to send positive feedback. However, Blogger already announced many amazing features as you say. Enjoy with Blogger! :) Feel free to share your opinion about this feature.